DFF alumnus Tom Meades has just graduated from the University of Brighton. Here he talks about his exciting final year project which explores sustainable alternatives to everyday product design. 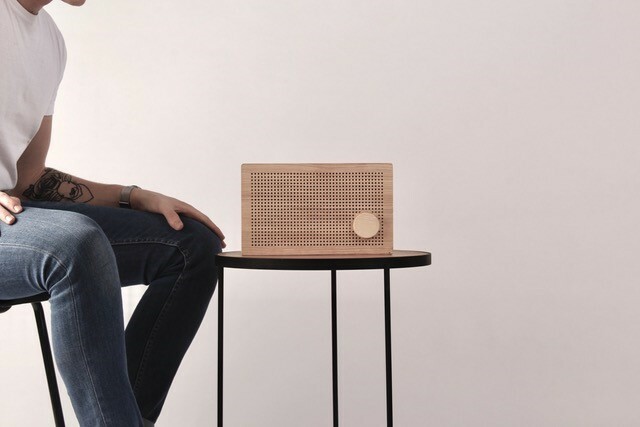 The Place speaker explores the idea of making products locally, giving consumers the option to buy a product made using local materials, with an almost zero-carbon footprint. The project was based on ideas sourced from Stuart Walker’s research, found in his book ‘Sustainable by Design’. Here he claims that introducing local production to a community would increase local jobs, create a local aesthetic through products, and teach people how to effectively recycle their materials after use. The Place speaker embodies the potentials of Walker’s theory, and could be introduced into any community worldwide – all they would need is access to a CNC-milling machine. The Waste speaker project was an opportunity for me to explore sustainable materials, and how they could be applied to produce products on an industrial scale. After sampling with a variety of materials, I chose to look at LDPE (recycled plastic bags.) I developed a process,where the plastic bags can be melted, pressurized and carved into accurate forms. This allowed me to design complex components on CAD, and mill them directly from the blocks of processed material. The advantage of using LDPE through this method, is that the material can be reused over 50 times. This avoids landfill and downcycling, and is the perfect example of how a material could become part of a circular design economy in the future. The People speaker derives from my research into the concept of ‘Emotional Durability.’ Sustainable Design researchers such as Jonathan Chapman, claim that where a consumer finds sentimental value in a product, they are more likely to repair it rather than discard it into landfill. I used this research to create a speaker that evoked memories for its user. As creative students’ desks come to the end of their lifecycle, they are often plastered with paint spills, doodles and cutting marks that to some would like like a mess. However, to the artists who used the specific desks, these would be reminders of their time at university and the development of their skills. I used a similar process to the Place project, where I took the wooden desks, and milled into them using a CNC-machine. This allowed me to again use CAD, to create detailed components that could fit together to form a working product. The advantage of this project is that it transferable to a variety of materials and products. The consumer could simply download the CAD drawing, and then carve a product from a material of their choice. Each of these projects presents a new kind of manufacture, that will each drastically reduce environmental impact and also offer an individual quirky aesthetic. I aim to carry on with this project, and expand away from the speaker design, to produce alternative products from different fields. produce a range of products that look great and offer an alternative to our current unsustainable manufacturing system.